After a 3-year exploration into the world of sales and marketing with Phonak LyricTM, I have found my way ‘Back to the Future’, or at least this is how I view my professional transition back to my audiological roots as Audiology Training & Education Manager. Hearing aids, like many other technologies, have evolved so quickly over the last couple of decades that it is difficult sometimes to remember what was and imagine what can possibly be yet to come. I call it ‘going back to the future’, because my shift in focus has reminded me that there can in fact be no future hearing aid technology developments without the foundation for these being firmly rooted in audiological fundamentals and ultimately, the benefits these technologies provide to the wearer. Suffice it to say, in my new role I have been consuming a range of audiological research papers and have noticed that assessment methodology seems to be shifting from purely lab-based single-scale assessment to more ecologically valid assessments. But what does that mean exactly? Well, I recently gained a better understanding of this when I had the privilege of visiting the DELTA SenseLab facilities in Denmark. DELTA SenseLab is a division of FORCE Technology which is an independent technological consultancy and testing organisation. They focus in particular on subjective and perceptual evaluation in the domains of audio, haptic/tactile and visual stimuli. 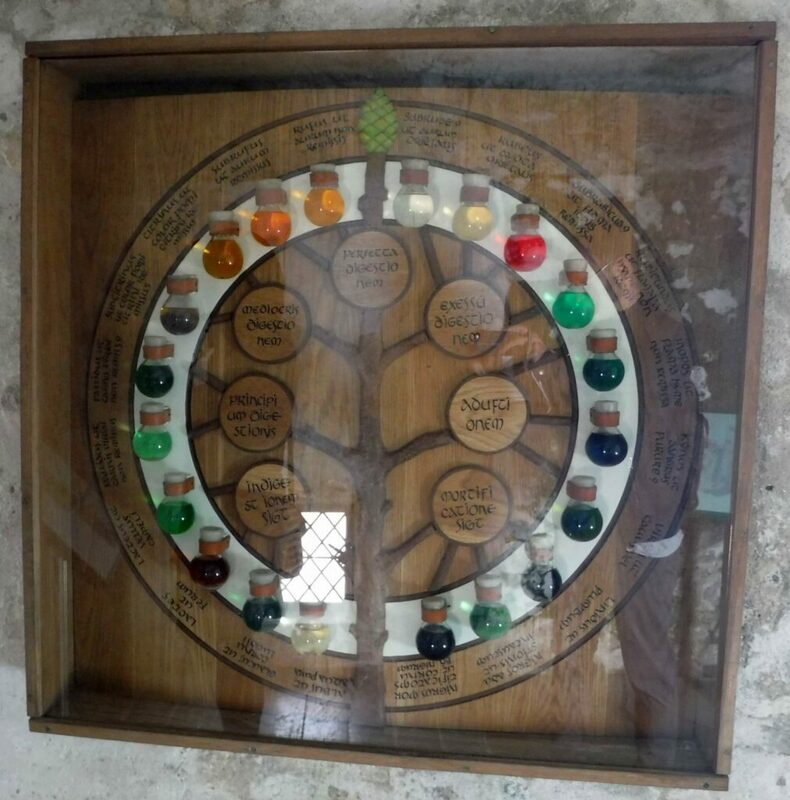 Perceptual or sensory evaluation has existed in the medical industry since the 16th century when the “Urine profile/ Urine wheel” (Figure 1) was designed to help doctors identify illnesses by creating a sensory profile of a patient’s urine in terms of its colour, smell, and even taste! Perceptual profiles are in essence a consensus lexicon – a streamlined set of unbiased and unambiguous words defined for a common understanding of what is meant when talking about sensory attributes of something . Since the Urine wheel, sensory evaluation has been adopted and widely used within the food industry – my particular favorites being the Wine aroma and Chocolate flavor characteristics wheels. You might be wondering now how this relates to our industry though? 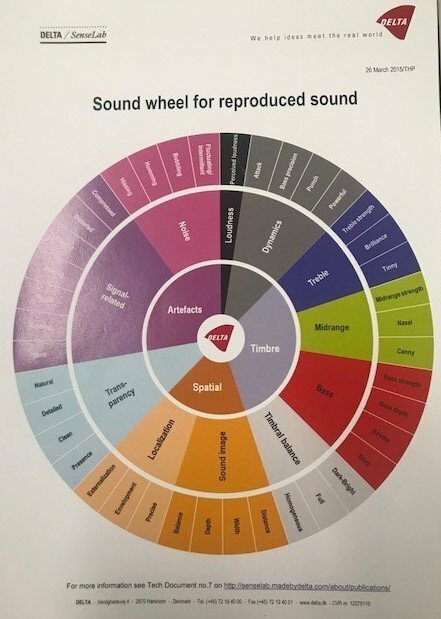 Well, where audio grading was previously done in single scales, DELTA SenseLab has now published the Sound wheel for reproduced sound defining a vocabulary for audio professionals to use when talking about sound reproduction and differences between products. Before DELTA SenseLab undertake a study to evaluate hearing aid technology features, the first step in the process is to invite a panel of expert human assessors, trained to objectively evaluate and define the sensory attributes of product characteristics which will be explored through the study.1 For example, the characteristic “Timbre” may be defined as Treble/ Midrange/Bass/ Timbral balance, and Timbral balance may be further attributed as Dark-Bright, Full, or Homogenous (Figure 2). Once defined, the study begins. This is exactly what was done when we put our Phonak TV connector paired with Audeo B-Direct technology through its paces for the benchmark study of hearing aid streamers in 2017. The expert assessors defined their ideal sound profile across 6 attributes – Bass, Treble, Reverberation, Naturalness, Dynamics and Details – and then rated their preferences of the Phonak streaming solution, as well as that of two competitor technologies against each other and their pre-defined ideal profile. The results of this study revealed that the Phonak TV connector together with the Audeo B-Direct hearing aids matched the ideal profile very closely and was preferred over its competitors for streaming of speech dominant TV signals. Further details of the study may be reviewed on the Phonak Evidence Page. This is just one example of a study undertaken by Phonak in collaboration with DELTA SenseLab in this ecologically valid way. At Phonak we pride ourselves on the strength of our evidence-based validation and I look forward to reading future studies conducted in a similar way to validate the quality and benefits of all the technologies we deliver for wearers as well as for the Hearing Care Professionals fitting them, ensuring that the sensory attributes of our product features closely mirror those of the wearer’s ideal in the Real World. Legarth, S., Latzel, M., & Appleton-Huber, J. (2017). TV connector – superior listening to television programmes containing speech. Phonak Field Study News. Is the Sound Wheel available for clinical use? Tania qualified as an Audiologist at the University of Cape Town, South Africa. 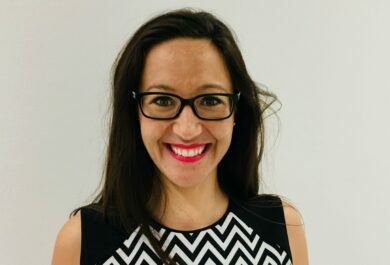 She gained diverse experience in clinical practice working within both the public and private sectors in the United Kingdom, before joining Phonak in 2013. She is now the Audiology Training & Education Manager at Phonak HQ, Switzerland. In her leisure time she enjoys exploring the Swiss outdoors on her bicycle.